Winsor & Newton's Cotman watercolor brushses are a range of synthetic brushes made by blending fibers of different thicknesses to achieve the most important qualities sought after by the watercolorist — strength, spring, and color holding capacity. 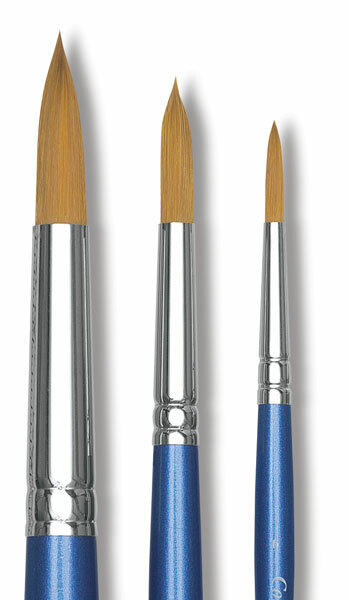 Cotman watercolor brushes, except for some of the Wash brushes, have nickel-plated ferrules and short blue lacquered handles. 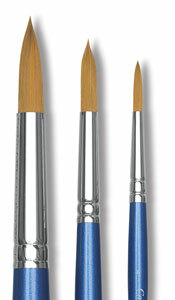 Rigger — A Rigger is a specialized Round brush for painting fine lines. It can also be used, with practice, for lettering. The original Rigger was a brush that was invented in the 19th century for painting the riggings on sailing ships. It is narrow in diameter, with very long hair. Designers' Round — The Designers' Round is a variant on the regular Round brush that is designed for highly detailed application. (Another name for this brush would be a "spotter"!) It is narrower, with less of a belly and lower color carrying capacity, and the hair is shorter for fine control. Round — Winsor & Newton's Cotman Round is a full bellied round brush with fibers of varying widths, so that it has both springiness and high color carrying capacity.